Back at Christmas I wrote a piece about why I was choosing to shop on the internet rather than brave the crowds on Oxford Street. I hated abandoning my favourite past time of browsing the shops, but the shoving of pedestrians both inside and outside the stores was just too much to handle. Seems abandoning the shops may have been wise for health reasons as well, and I'm not talking about the panic attacks associated with scoring this season's hottest Miu Miu heels in my size. 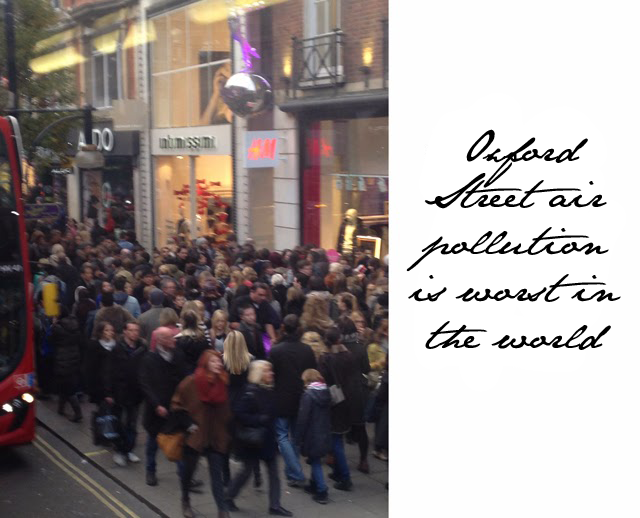 This weekend The Sunday Times wrote a piece on the idea that shopping Oxford Street may in fact be hazardous to your health because of other reasons. Turns out Oxford Street is a bit of an air pollution problem. Actually, it's more than a problem as The Times is claiming it has been marked as having the highest levels of nitrogen dioxide pollution in the world. What does this mean for the general public shopping Oxford Street? Well, studies have shown that an increased level of nitrogen dioxide in the air can trigger ashma and heart attacks. Yikes! As if shopping wasn't stressful enough as an experience in central London. The question is, what are the powers that be, in London, doing about the air pollution on Oxford Street? Well, most of the pollution is caused by buses and traffic in general. For those of you that have ever shopped Oxford Street at any time of day, you'll know the road is overrun with diesel buses. London's Transportation people are cutting down on buses on the Oxford Street route and also looking into greener options when it comes to transportation. London, knock yourself out. I'm keeping my computer shopping option as a favourite for now.